You may remember a few weeks ago it was National Perfume Day and I was chatting all about perfumes and how what I love most about them is the memories that different scents can hold. Memory is something we probably all take for granted... thoughts of our childhood, high school silliness, our first loves, the amazing holidays we've been on but what if one day all that is gone and the memories we once had are no longer there. Did you know dementia is the leading cause of death for women in the UK? No? Nor did I! And did you know that one of the earliest signs can be the loss of smell? Out of the 850,000 people with dementia in this country 500,000 of them are women and after the age of 65 the risk of getting dementia doubles ever 5 years. So it's very likely that in some shape or form this debilitating condition will affect your life at some stage. 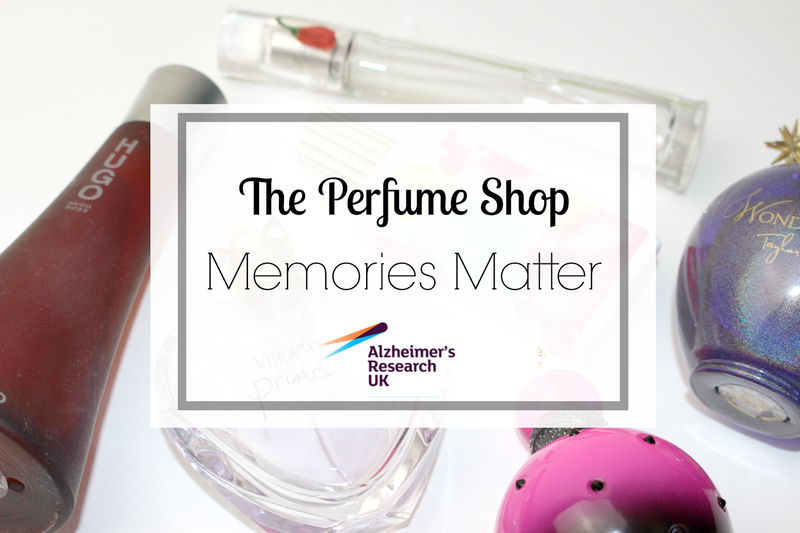 Last year The Perfume Shop partnered up with Alzheimer's Research UK and created 'Memories Matter' , a campaign to help raise awareness of the strong link between scent and memory and since then they have managed to raise a whopping £17,000. From that money raised TPS have managed to help support pioneering female researchers in finding preventions, treatments and ultimately a cure for those affected by dementia. Dementia is a syndrome which has many, many symptoms including memory loss, mental agility, language, thinking speed, judgement and understanding. Whilst not all sufferers are elderly, age is the most significant contributing factor to dementia. Firstly, The Perfume Shop are running fundraising initiatives in store through £1 gift wrapping. Yup that's right, just donate £1 and you'll get your purchase beautifully gift wrapped - perfect if you are buying a present, and even if you aren't.... £1 onto your bill is nothing! Plus from Saturday 16th May to Sunday 25th May, you guys can simply tweet your favourite scent memory to @ThePerfumeShop using #MemoriesMatter and The Perfume Shop will donate £1 for every post. Amazing right? So this next week, make sure you check out Memories Matter and maybe just imagine what it would be like to loose them. I didn't know it was such a big killer especially for women. I associate many smells with certain memories and it would be so hard to lose both of these. What a lovely campaign! Both my grandad and great nan passed away due to dementia.